It’s September, and it is Bourbon Heritage Month again. We’re big fans, so we thought we’d do our patriotic duty and drink some bourbon. Bourbon actually has a fair range of styles and flavors these days, especially given the craft products that are now on the market. While the mash bill and making must meet strict criteria in order to be bourbon, there are still many things that the distiller can choose to vary that will make the spirit distinct. To celebrate this variety, we decided to pull four quite different bottles out of the liquor cabinet (out of the many :)) and see what they had to offer. Read on to see which bourbons we chose. 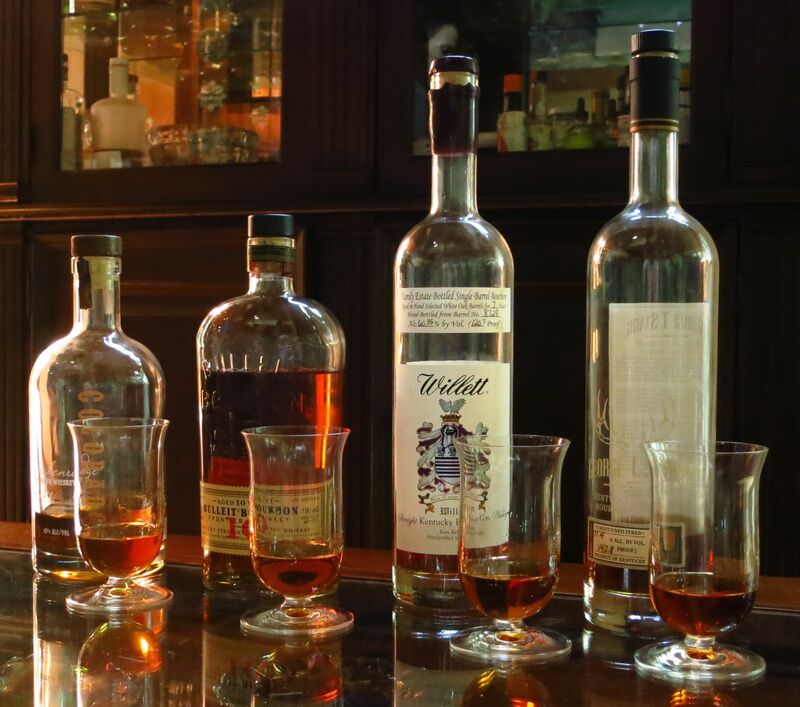 The four bourbons we picked were Breckenridge, Bulleit 10, Willett 7 and the George T Stagg. Nose: Crackerjack and butterscotch, plus a little bit of wood and spice. Strong fruit notes like apple or pear after it opens up. Palate: Brown sugar to start which immediately moves into barrel wood. Sweet corn and pear on the mid-palate. Pear continues into a lightly spicy, dry finish. Light-bodied for a bourbon, and the lightest of this bunch. Sweet corn notes stand out more when directly compared to the others. Nose: Toffee, maple, roasted corn. Palate: Maple, oak and some vegetal notes, like corn husk or silk, to start. Barrel wood and mild, nutty root vegetable notes (like parsnips) on the mid-palate and going into the finish. Surprise cherry notes at the beginning of the finish. Black pepper notes show up when tasted side by side with the others. Nose: Mocha, lots of barrel wood. Slight funky notes. Little bit of a nutty smell like walnut skin, slightly bitter and astringent. Fleeting hint of menthol. Palate: Syrupy sweet caramel to start, followed by black fruit and some hints of violet. Darker flavors from the mid-palate to the finish – oak, toasted grain, coffee, chocolate. Walnut notes show up as it opens up. Spicy, nutty flavors are more pronounced when compared to the others. Nose: Maple sugar candy. Caramel. Vanilla cream. Little bit of dried leaf smell. Leathery, earthy notes. Palate: Really strong buttery toffee on the intro. Petrol, mineral notes at the start of the mid-palate. Mid-palate has a lot of oak and leather earthy notes. Little bit of fruit and cane like blackberry and blackberry brambles on the finish. Adding a few drops of water bring out the maple notes. Wood astringency starts coming more and more to the fore on the finish as you drink more of it. Strong butterscotch/petrol notes at the start really stand out when tasted side-by-side with the others. Of course, we don’t just drink straight bourbon all the time, we very much like to mix with it as well. So we noodled with several things this afternoon. Christa made the point that one never sees a bourbon drink with falernum. There maybe a reason for that, seen as after trying many different combinations of bourbon, liqueurs, fruit juices and bitters we just couldn’t come up with something that was nicely balanced. Still the base combo of bourbon and falernum is nice, so we’ll have to keep playing with that. 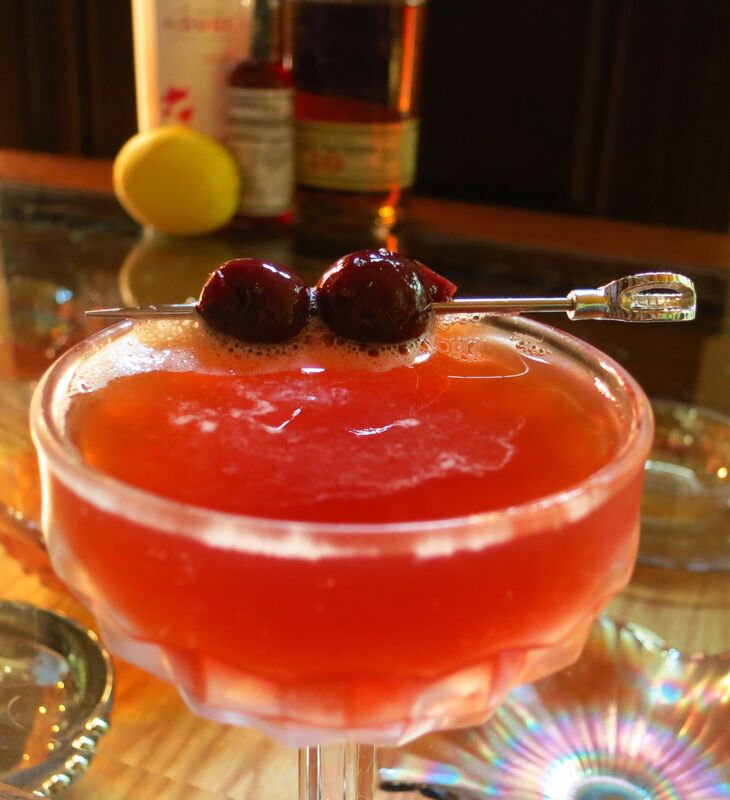 So we took another tack, and found a tasty combination of bourbon, cherry liqueur, lemon juice, and Peychaud’s bitters instead. Nose: Barrel notes, cherry pie, lemon, black tea, slightly astringent oak, faint note of tobacco. Palate: Sweet lemon and cherry to start, followed by bitter herbal cherry. Caramel and tobacco on the mid-palate. Faintly astringent bitter lemon on the finish with some hints of strawberry -rhubarb pie. 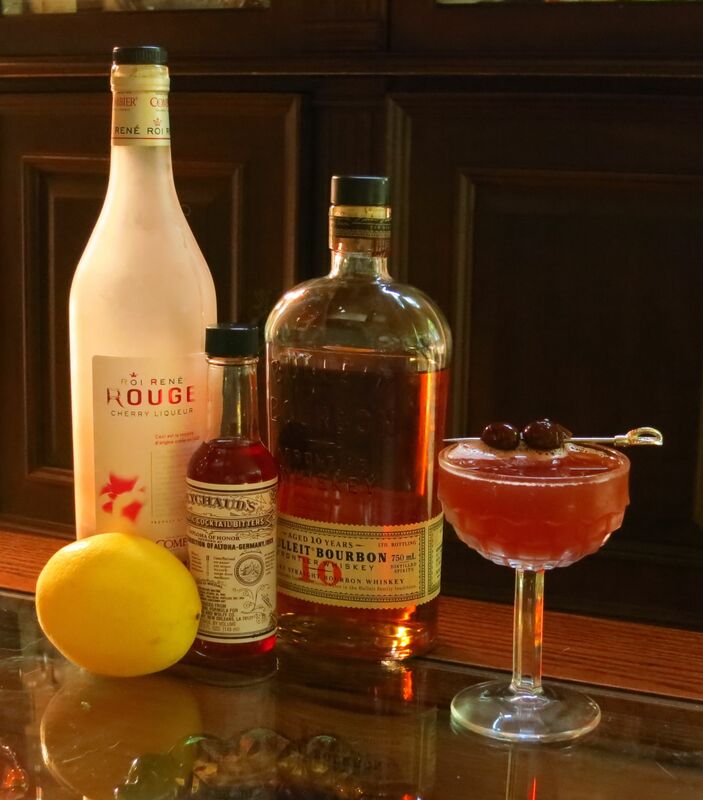 This entry was posted in bourbon, cherry liqueur, lemon juice, Original Cocktail, peychauds bitters, Tasting Notes and tagged breckenridge bourbon, bulleit 10 yr bourbon, george t stagg bourbon, o pioneer cocktail recipe, Willett Bourbon. Bookmark the permalink.